When some of us were growing up, we were asked the age-old question, “What do you want to be?” While there are a ton of pretty frequent answers… astronaut, doctor, police officer… we’re also always told that we can be anything. President! Chief Surgeon! Mars Settler! But, what about the combination positions? We want to be the Head Chef on the Mars Space Station! Those are the dreams that are really worth exploring. So, those of us who had the creative impulses to really say what we wanted to be had some pretty inventive suggestions. Our favorite? The Princess Superhero! It is a pretty tough accessory to acquire that both suggests a person of royal personage while still being an item worthy to be wielded in the midst of battle with the archvillains of the world. Fortunately, we have the Red Star Gold Crown that is the perfect fit. The crown headband has a shiny reflective surface which gleams gold and conveys the fact that you hold an important position in the matriarchal monarchy back on your mystical island. But, the shining red star and sleek design show that you’re ready for the active lifestyle required of a woman ready to defend the entire world! 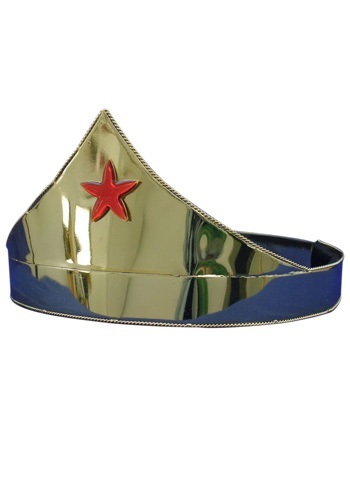 I order this crown to accesorize my wonder woman costume for this halloween, since I didn't like the one that came with the costume.Im so not happy with it. Its very big for anyone's head. its oversized. Its good material and all, however its heavy, too big and the shape is not ww-like, is more like a peagent crown. whatever comes with your costume will be better than this.